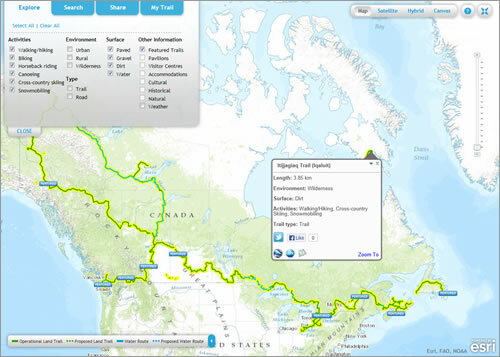 A web mapping application from Esri Canada Limited displays in detail the 16,800-kilometer route of the Trans Canada Trail. Canadians and visitors to the country can use the application to map their recreational activities on the trail, including bike rides, hikes, and canoe trips. They also can search for cultural and historic sites, find accommodations such as hotels, and get the local temperature. By creating a free account, people also can post stories and photographs that document their adventures on the trail. Read the article. You can use this interactive map to find places to hike, bike, canoe, ski, snowmobile, and ride horses on the Trans Canada Trail. 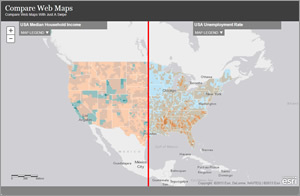 Want to learn a quick and easy way to compare two web maps side by side? Use the preview capabilities in the Swipe Tool, which you can find in ArcGIS Online. Read the tip. The South Carolina Air National Guard quickly processed satellite imagery after Hurricane Irene by using GeoImaging Tools for ArcGIS from PCI Geomatics. Read the article. Learn how to cultivate the next generation of GIS users and spatial thinkers at the Esri Education GIS Conference, July 6–9, 2013. Read the article and watch a video from Esri director of education David DiBiase that highlights the best reasons to attend. As more people work past traditional retirement age, government agencies and businesses ponder what type of services and goods older employees will need. Read this article about how Esri data can help with this analysis. View a map that shows where high percentages of senior citizens live in the United States. Compare the path of the EF5 tornado in Moore, Oklahoma, to where tornadoes touched down there in 1999 and 2003. View the map. Compare before and after damage using this Moore Tornado Swipe Map. Watch a technical workshop that explains how to use location analytics as part of your business intelligence system. See 23 desktop and web-based applications created by Esri's Applications Prototype lab. Watch the video. Get detailed, ready-to-use street network data for Australia and New Zealand with StreetMap Premium for ArcGIS. Submit your papers for the upcoming Esri Latin America; Europe, Middle East, and Africa; and Asia Pacific user conferences. Mark November 20 on your calendar. It's GIS Day! Get tips and resources to plan your event at the GIS Day booth, Hall D, at the Esri International User Conference (Esri UC). Want to learn about the value location analytics and GIS will bring to your business? The Esri Business Summit offers all you need to know, including success stories from business leaders like you who rely on the power of location every day. Read the article. Pondering whether to take the plunge and contribute to the Community Maps Program? These Esri UC sessions will walk you through how to create and publish your maps and conform to the Local Government Information Model schema. Looking for a hip place to eat a hot pizza or drink a cold brew after a busy day at the Esri UC? The San Diego Shortlist, an Esri story map, will steer you in the right direction to dine, see amazing architectural design, or just stop and smell the flowers. There are several different ways to map an election, including using a dasymetric dot density map. Read Esri senior cartographer Ken Field's blog and learn how one was created for the 2012 US presidential election. Field will explain his technique at the Esri UC. Join the ArcGIS beta community and take ArcGIS Runtime SDK for Mac OS X for a spin. Get started. Change your color ramp in four clicks. Read the tip. The clock is ticking, but there's still time to submit your app in the User Software Applications Fair at the Esri UC. Find out how to migrate computer-assisted design (CAD) data to a geodatabase and download the latest ArcGIS for AutoCAD plug-in. Learn more. See what's new in this latest ArcGIS 10.1 for Desktop add-in, which lets users play live streams of video or video files in a map. Read the blog. ArcGIS for Developers gives you what you need to add geo to your apps using Esri's cloud services. Get a 30-day free trial to ArcGIS Online. Begin learning how to create 3D cities at Creating Smart 3D City Models with Esri CityEngine, a live training seminar on June 27, 2013. See what you can do with CityEngine and its web viewer and slide tool. Get a free software trial, too. See what's new such as support for class.on() style events for the map, layers, and tasks. Read the blog. Desktop, Developer, and Enterprise exams for ArcGIS 10.1 are available at any Pearson Vue testing center worldwide. Learn more about the Esri Technical Certification Program. Esri president Jack Dangermond's vision for a modern atlas depends on geographic knowledge from you. Read the blog. Compare 1990 Landsat satellite images to recent true-color imagery of places such as Mount Kilimanjaro, Tanzania; Columbia Glacier, Alaska; and Palm Springs, California. What types of change do you detect? Gain experience with spatial analysis methods, including location analysis, change over time, and geographic distribution, with GIS Tutorial 2: Spatial Analysis Workbook. 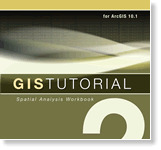 It has been updated for ArcGIS 10.1 for Desktop. Buy the book. Esri offers cost-effective solutions to US customers who want to configure or upgrade their GIS. Esri's server, desktop, mobile, and data products are prepackaged with ArcGIS. Search for a hardware solution.